“I was down in the dumps,” said Eli Tomac as he walked to the podium, finally ready to celebrate a victory. 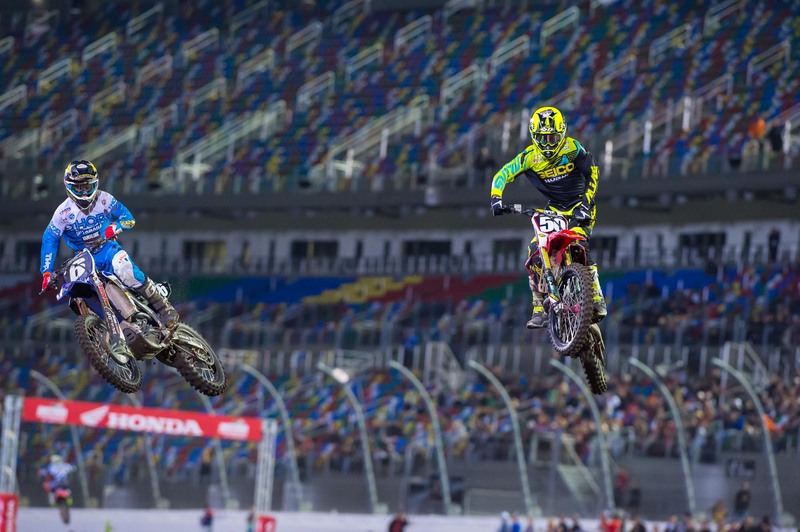 “I expect to win—those are my expectations.” But the new man at Monster Energy Kawasaki had not won, and in fact only grabbed one podium until this night in Daytona. But this night was vintage Eli—much more like the rider we expected to see throughout the first eight rounds of the series. All day, he was just bad fast, taking the fastest time in qualifying, dominating his heat race by even pulling away from Ryan Dungey, and then holding Dungey at bay through all twenty laps of the main event. Dungey, as always, was super solid and kept the heat on Tomac the whole time, but Tomac never wavered, never bobbled, and held strong all the way to the end. This is a pretty big win that could get Eli and his team over the hump, but Team Manager Bruce Stjernstrom assures us that panic had never set in anyway. “We’ve got to every race thinking there’s no reason we can’t win,” he said. On this night, they finally did it. It helped that Eli finally got a good start, but that actually underlines something else. All season, Tomac had shown speed in spurts—a good practice session here, a heat race win there—but he had not consistently brought that speed the whole time. 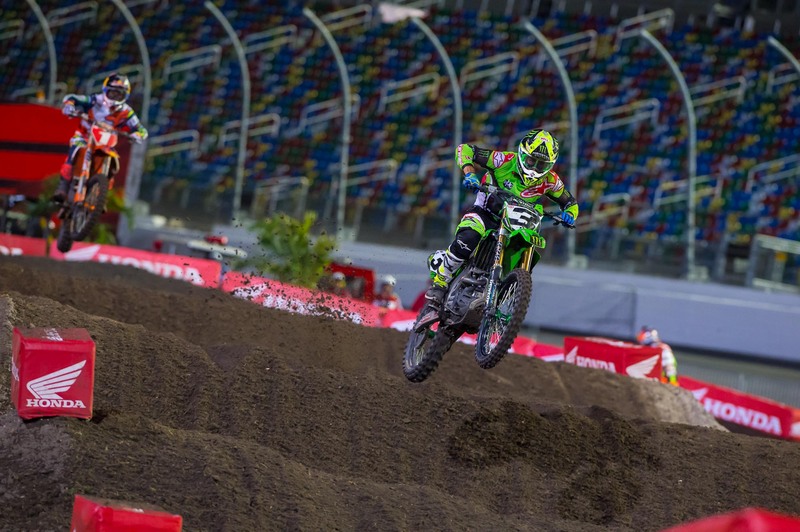 Daytona’s start absolutely favored the inside gate, and Tomac’s fast qualifying time gave him that good gate, which he used to control the first turn and get away. That gave him first gate pick for the main, and he used that again to his advantage—Dungey had a slight jump on him, but Eli hugged the inside for the first few corners until he finally battled his way past to get the lead. Finally, Eli brought the same speed to every qualifying session, the heat and the main, which gave him the good gate picks and the starts needed to win. Both main events were really exciting, with Tomac and Dungey chasing each other through every lap in the 450s, and the 250 class offering up an incredible four-rider battle for the win. Oddly, the good racing was the result of a track that didn’t offer any passing room. Every rider said the track was one lined, but it just so happened that in the 250s, everyone stacked up behind leader Malcolm Stewart, and in the 450s Dungey and Tomac could match each other’s every move. Sometimes a simple, one-lined track just keeps everyone close, but it takes the absolute perfect combination of the right guys getting the right starts. That’s what happened in the 250s. 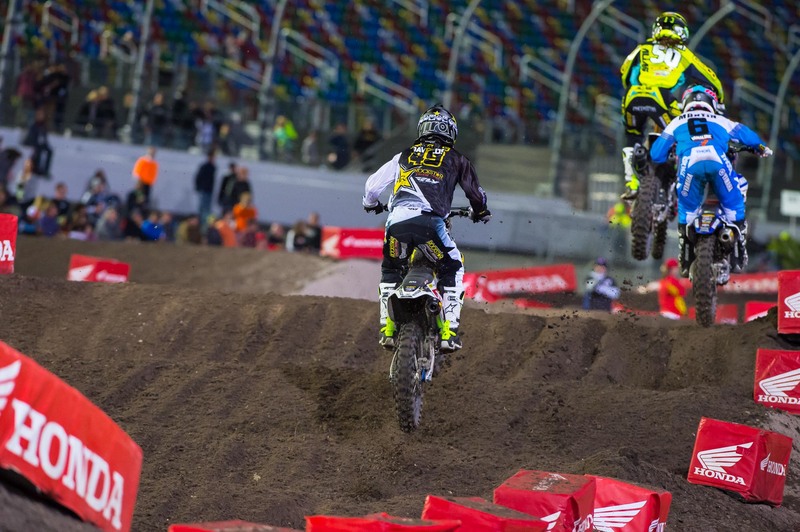 Malcolm Stewart had the early lead with Jeremy Martin all over him, and Martin Davalos close behind. They just couldn’t find a way to separate from each other, and stayed wheel to wheel the whole way. Then Justin Hill actually did find a way to make time, and he closed in to make it a four-way battle. 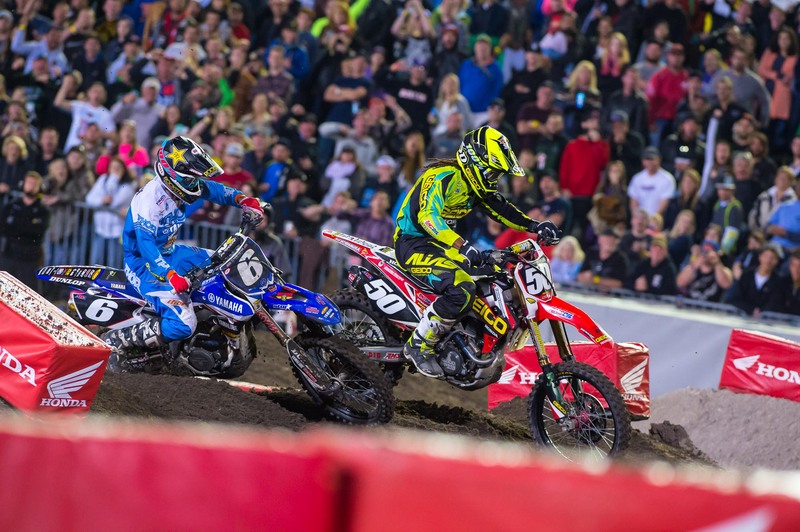 It was so good, many were buzzing that this was the closest 250 race they’d seen in ages—maybe ever! It took 12 laps, but Martin finally found a way around Mookie to get the lead, and he hung on from there to notch the win. Hill got Stewart as well, then Davalos tried to get Malcolm on the last lap, but Malcolm held him off…until stalling his bike in the last turn! This let Davalos grab the podium. But look, all four of the guys—Martin, Hill, Davalos and Stewart—were close the whole way. Any one of them can go to Toronto feeling like the race will be theirs. But Martin might have a little extra boost. After the race the Yamalube/Star Racing Yamaha rider told us about bike a riding style changes he’s made for this season, basically rolling his handlebars forward and running less sag in his rear shock. 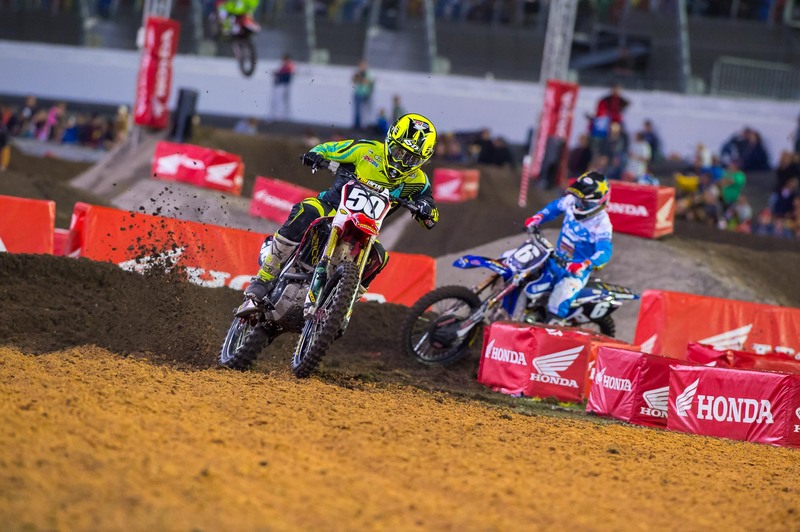 He’s getting forward on the bike, and he thinks it’s helped his supercross speed. Mostly, he was proud of having the patience to wait for an opening on Stewart—which took 12 laps to find—instead of making a mistake and throwing it all away. 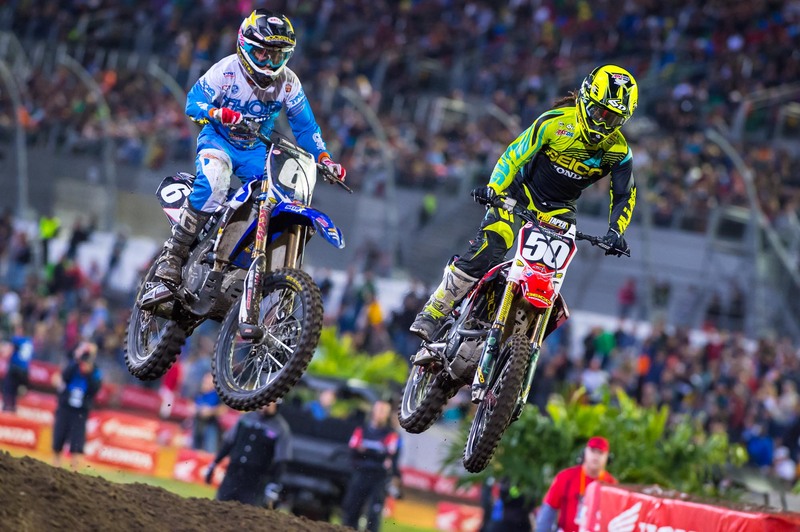 Hill was super fast last week in Atlanta, going from a first-turn crash to fifth. The Troy Lee Designs/Red Bull KTM rider was really quick again here, getting the fastest qualifying time, and making up ground to climb from fourth to second. “It just feels good to be healthy again so I can race those guys for 15 laps,” said Hill, who struggled through an injury-plagued 2015 season. Back to the 450s. 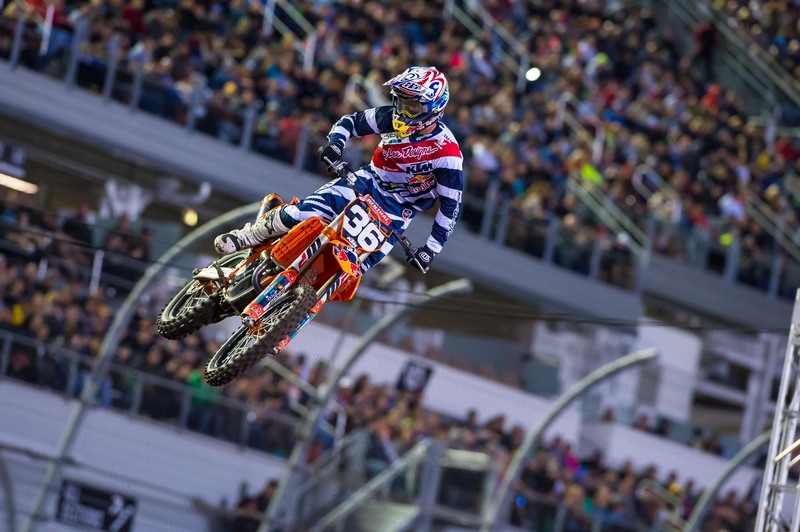 On the first lap, French duo Marvin Musquin and Christophe Pourcel were right behind Tomac and Dungey. Red Bull KTM’s Musquin bobbled and bumped into Pourcel, knocking him down, but Pourcel was right in the main line, which jammed up a ton of riders behind him. That changed the whole race, as Red Bull KTM’s Musquin snuck away with third and everyone else ended up way, way behind almost immediately. Musquin was solid in third, and Rockstar Energy Husqvarna’s Jason Anderson, who basically rode over Pourcel’s bike to get through, rode by himself in fourth the whole way. 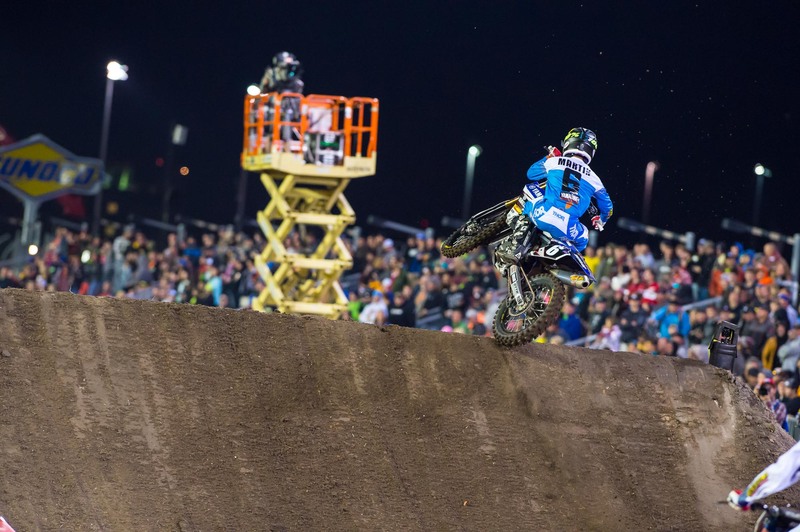 Ken Roczen got yet another horrible start on his Soaring Eagle/Jimmy John’s RCH Suzuki. He battled the whole way, getting around Honda HRC’s Trey Canard in the early going to rally to fifth. Kenny’s momentum from that big Dallas win has evaporated due to bad starts the last two weeks. Canard was sixth. Maybe the story of the race was HLTN CO’s Josh Grant, who drove his van and bike out from California for a fishing trip—with a race thrown in—and rode strong the whole way to finish seventh! This kind of thing is exactly what Josh Grant does. Tough break for Davi Millsaps, who was solid in seventh late on his BTOSports.com KTM until he had a big crash with about five laps to go. That was the end of his race—we’ll search for a health update on Davi shortly. We’ll also be on the lookout for an update on Yoshimura Suzuki’s James Stewart, who cased a whoop on the very first lap of his heat race, and then looped out. He was beat up after that, and his night was done. Rough night for Monster Energy/360Fly Yamaha’s Chad Reed, who didn’t like the tight, one-lined track (or, as is the usual case, probably felt like many others but was just more outspoken about it) and ended up a disappointing twelfth.